Welcome to the 2nd stage of the modern era of Touhou. In this era, instead of having enemy health in the top end of the screen, enemy health will be shown as a circular ring around the enemy sprite. 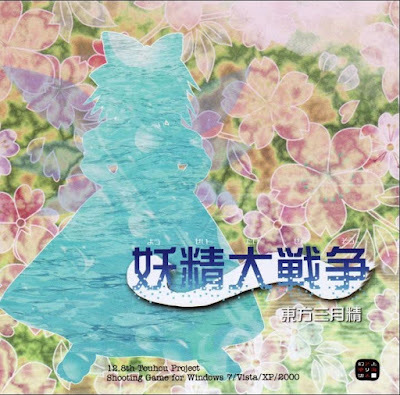 Now this is another creative release by ZUN. Guess what? The main character is the ice fairy Cirno! This game is still a vertical scrolling danmaku type but it has special features that most gane of the series don't have. The story is about Cirno who happened to find that her house is destroyed. It is done by the three fairies of light (Sunny Milk, Luna Child and Star Sapphire). Cirno sees that as a declaration of war even though the three fairies didn't meant that. 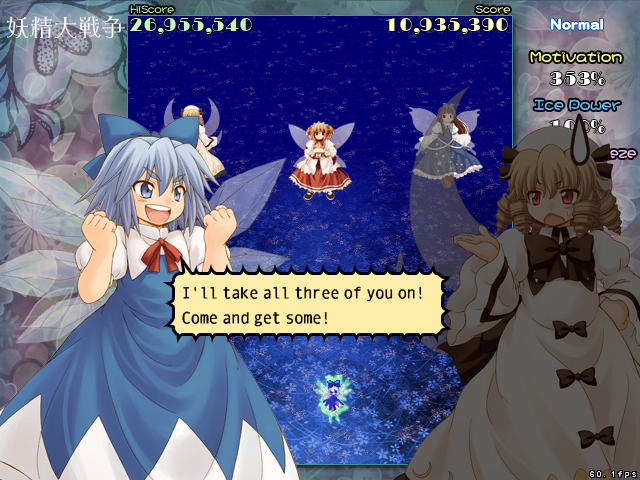 Thus, a battle between Cirno and the three fairies (yes, all three of them at once). After defeating them, Cirno self-proclaimed that she is the strongest and wishes to challenge the "rumoured" strong challenge who is currently going for flower viewing. She went ahead and challenge that person. Man, she really didn't learn from what happened in TH 9 (meeting Yuuka) and TH 12.3 (meeting Okuu). 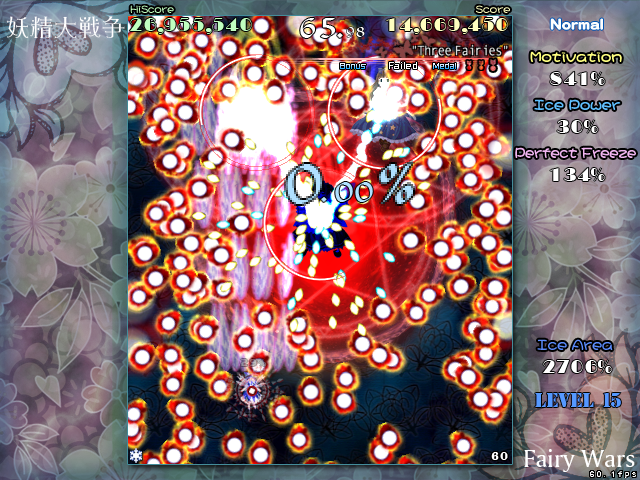 The unique mechanics in this game is that Cirno can actually freeze bullets to remove the bullets that are frozen by her ability. Most of her stats are shown as percentage. Holding "z" button will charge her freezing power from 0% to 100%. The minimum charge to release her ice is at 40%. The larger the charge, the longer the ice can form and larger space can be occupied. All the bullets she froze will be later added to her bomb piece (max 3 or 300%). Her shooting powers will be increased as well up to level 16! Grazing bullets will increase the charge rate. Her health is shown as morality where she will constantly gain it when shooting / defeating the enemies. However, her ability has limitations where she can't use her normal freeze to froze fires and lasers will penetrate her frozen bullets and shatter it to form even more bullets that can cause danger to Cirno itself. Lastly, light rays (only in extra stage) will cause her morality to drop upon exposure to the rays. Since the game itself is like a side story, it has only 3 stages and 1 extra stages. Below are some screencap and a replay of the extra stage. Yep, A battle against 3 enemies at once. So far the most enemies in 1 boss battle in the touhou series. 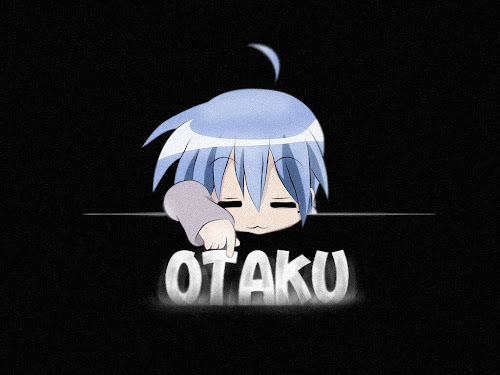 Well, Cirno is the strongest after all isn't she? Extra stage. I could say one of the hardest extra bosses in the series since it requires perfect timing on when and where to freeze the bullets. This game may look unfair at first sight but with proper rhythm of playing it, even the extra boss is won't be a big problem. Why? Besides having quick response (all touhou games need that), the player will only need to have a good insight on when to release the freeze charge. Wrong timing to release it will makes the game harder. If any mistakes happened, use the bomb which freezes everything including fire. Both bomb and morality refills at rather fast rate anyway so with lots of training and memorising the stages, you can anticipate their movements and bullets which will makes the game lot easier. Trust me. 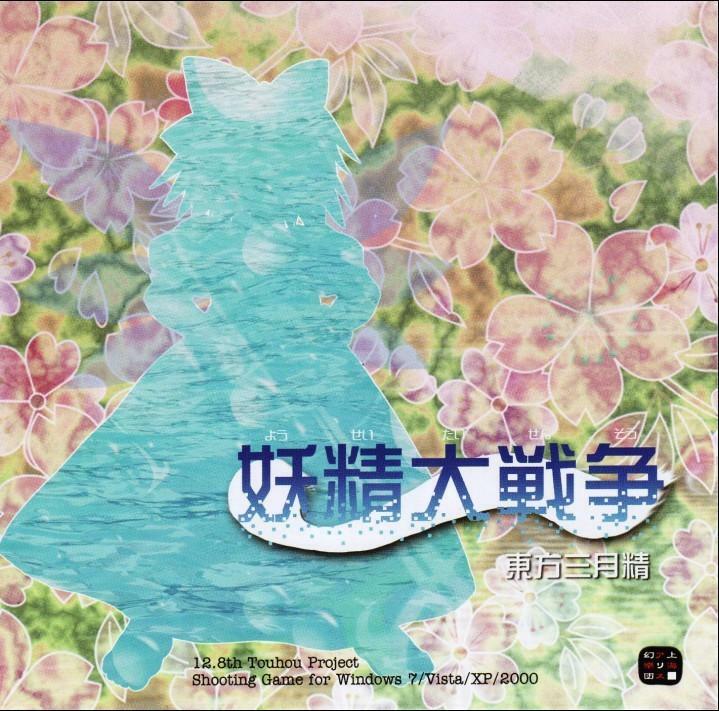 THat is all for Touhou 12.8 so see ya in a few days for another review. Bye!